The peaceful residential streets of Adamstown today, give no hint of the industrial conflict that nearly boiled over into violence 130 years ago. In 1888 miners were paid a set price per ton of coal they extracted. Where a coal seam contained thick bands of stony impurities, the miners were effectively paid less, as the same amount of physical labour would win less coal. 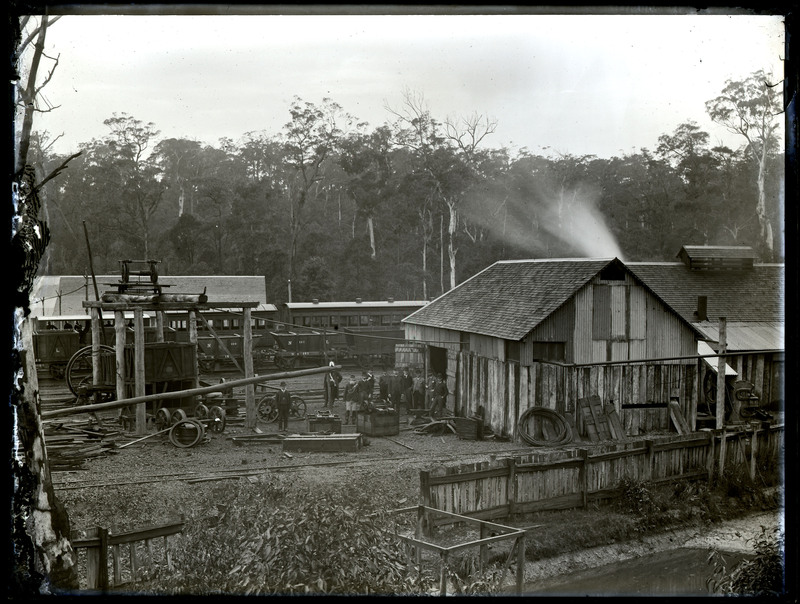 The miners of the Newcastle district pressed for the rate to be increased when there was more than 6 inches of impurities. The colliery owners rejected this claim and on 25 August a general strike began. Mining ceased, but the owners wanted to make some money by loading and exporting coal that had previously been brought to the surface. For this work they began using non-union labourers, so called “black-legs”. Opposition to this practice came to a head at New Lambton C Pit, located in Adamstown near present day Clinton Ave.
On Tuesday 18 September, the company sent six men to load coal, accompanied by a force of 30 police officers. Word spread quickly, and over a thousand miners and supporters flocked to the pit to harass the workers and persuade them to desist. Tensions increased and threatened to break out into uncontrolled rioting. Deft handling by police inspector Lynch defused the situation and the day ended with just a single minor injury. In response, the NSW Governor issued a proclamation that those “interrupting persons in the honest pursuit of their lawful occupation” would be rigorously prosecuted. Military reinforcements were sent from Sydney, and when another attempt to load coal took place two days later, the four “black-legs” who showed up were accompanied by a combined force of 173 police and soldiers who kept the indignant miners at a safe distance. The show of force had the desired effect and the industrial dispute simmered into stalemate. The strike lasted another two months before agreement was reached, and the miners returned to work on 24 November. New Lambton C Pit, Thursday 20 September 1888. Photo by Ralph Snowball, University of Newcastle, Cultural Collections. 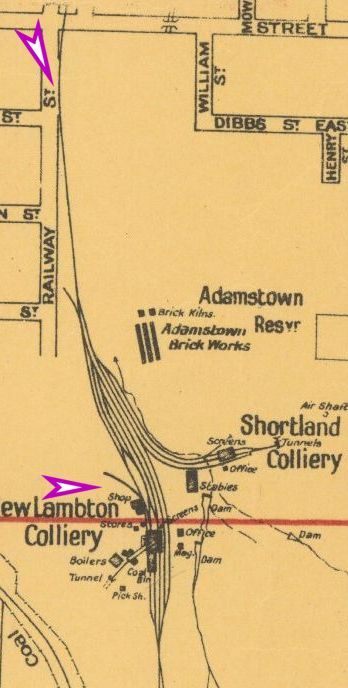 The railway to New Lambton C Pit ran adjacent to Bailey St Adamstown. The article above was first published in the September 2018 edition of The Local. The story of the New Lambton C Pit protest has many interesting aspects to it, which for reasons of space I had to omit from the published story above. 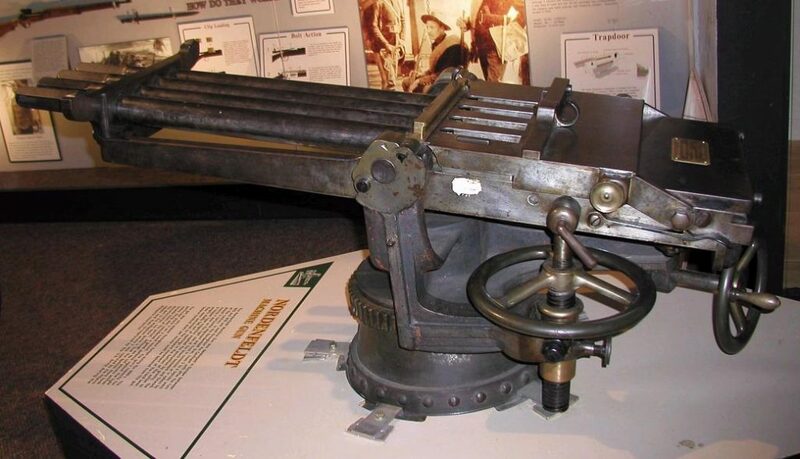 One example is the involvement of the military and the deployment of a Nordenfeldt gun. 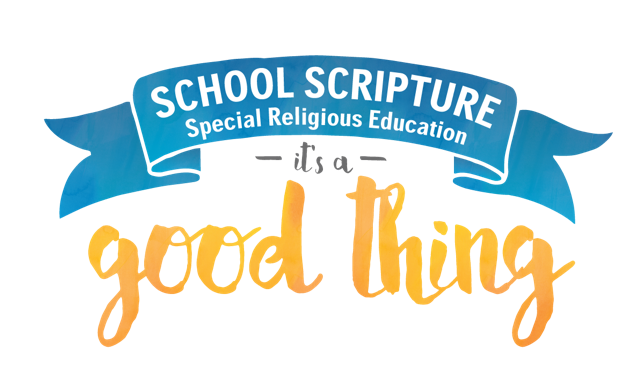 “… he immediately communicated with the police magistrate, Mr. Mair and Colonel Spalding. 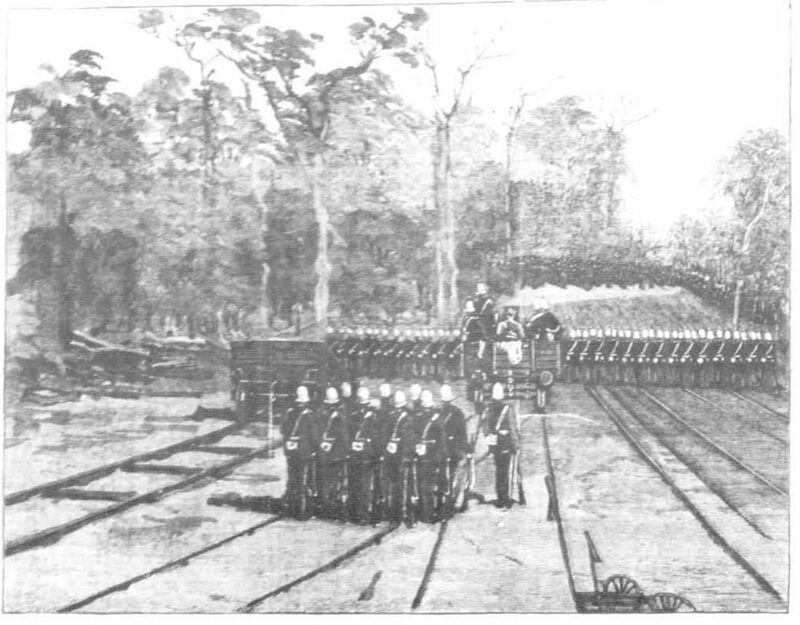 A special train was ordered and as soon as possible 25 of the Permanent Artillery with a Nordenfeldt gun, and under Colonel Spalding and Lieutenant Morris, were taken in the train, as well as 27 constables. “Whereas certain persons have, by combining and acting together, endeavoured to intimidate and oppressively interfere with certain of Her Majesty’s subjects in lawful pursuit of their occupations as workmen in certain of the coal mines in the county of Northumberland and other parts of the colony; and whereas there is every reason to believe that many of the persons, either guilty themselves of such acts of intimidation and unlawful interference, or countenancing the same by various acts of disorderly conduct, have not duly considered the criminal character of their proceedings or the penalties attaching to their illegal acts, while much concern is felt on account of the recent disturbance to a great industry in the county of Northumberland and elsewhere,and the consequent injury and distress which must inevitably fall upon many families and large classes of unoffending persons: it is nevertheless hereby notified that all persons offending as hereinbefore mentioned, or interrupting other persons in the honest pursuit of their lawful occupations by acts of intimidation or violence, or by disorderly conduct of any kind, will be rigorously prosecuted as the law directs. “And all persons are hereby warned to desist from such unlawful practices, and all subjects of Her Majesty are called upon to render assistance in protecting any persons from outrage or molestation, and in maintain ing law and order. The Evening News on 5 September 1888 ran an article explaining the background to the coal miners’ strike, and included a number of diagrams of coal seams around the district that showed bands of impurities within the seam. These impurities had various names such as ‘jerry’, ‘morgan’, and ‘myrtle’. 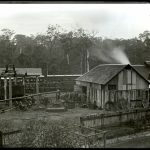 The University of Newcastle Cultural Collections site has three Ralph Snowball photos of the disturbance at New Lambton C Pit, each dated only as September 1888. From the newspaper reports we know that Tuesday 18 September 1888 and Thursday 20 September 1888 were the two days when large crowds gathered at the pit to protest the use of non-union labourers, so it is highly probable that the photos are from one or both of those days. After a careful reading of the newspaper accounts of the events of both days, I am reasonably certain that all three photographs are from Thursday 20 September 1888. In the following photograph, one of the men in the scene is Inspector Martin Brennan. On the Tuesday, Inspector Brennan only arrived at the mine site after 6pm, which in September is after sunset, so this photo must be from Thursday. 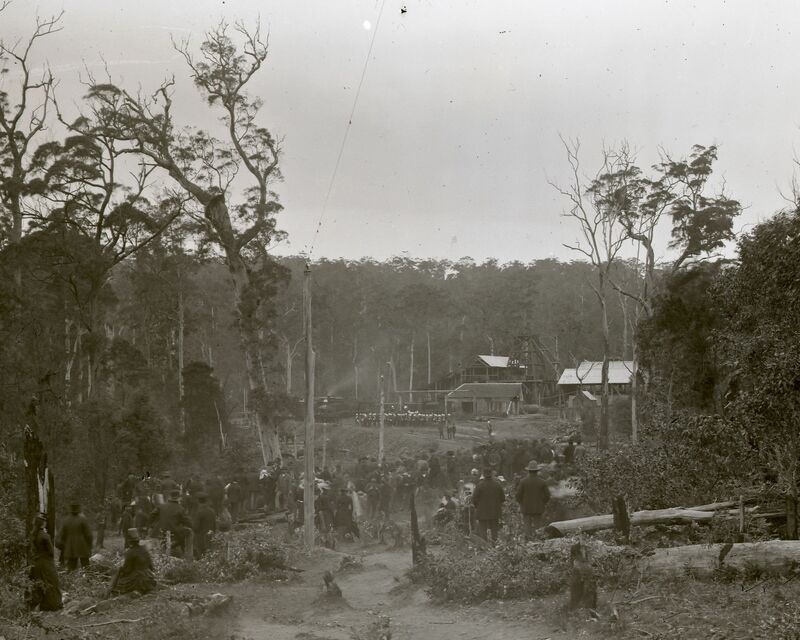 Officials at New Lambton C Pit, Adamstown, NSW, 20 September 1888. University of Newcastle, Cultural Collections. 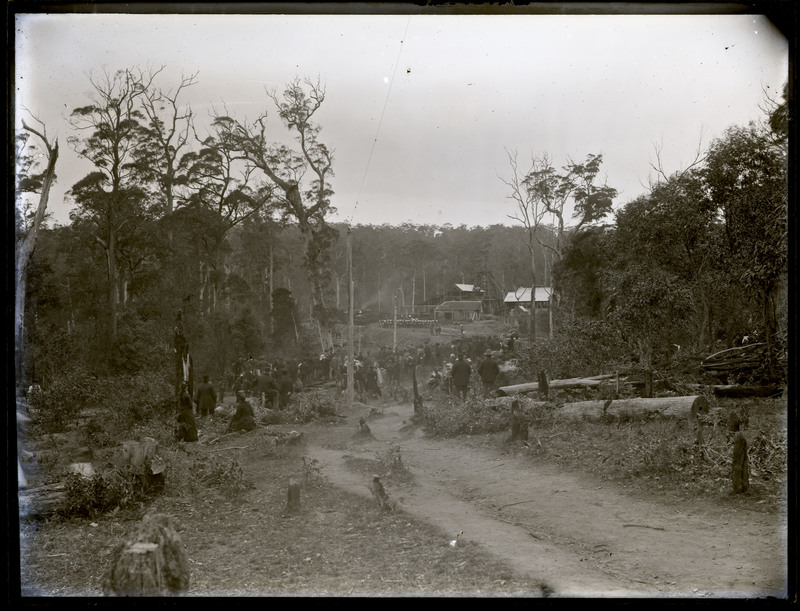 New Lambton C Pit disturbance, Adamstown, NSW, 20 September 1888. University of Newcastle, Cultural Collections. The following photograph shows a group of miners and family surrounding the workshop at the mine. While this could possibly be from Tuesday, I think its more likely to be Thursday. Firstly note that the crowd is quite orderly, and arranged for a posed photograph. Secondly, there is no evidence of any police officials, or black-leg workmen. This doesn’t correspond well with the events of Tuesday where there the tension and conflict continues all through the day until the workmen and the police leave the site by train at about 6pm, when it would have been quite dark. A map in the National Library of Australia shows the layout of the New Lambton C Pit, and I have marked on the map below the approximate locations where I believe Snowball’s photographs were taken from. The Australasian (Melbourne) newspaper, on 6 October 1888, printed a number of drawings of the New Lambton C Pit disturbance, seemingly based on Snowball’s photographs. The Australasian, 6 Oct 1888, p. 13. Miners watching the “Workmen” at New Lambton. The Australasian, 6 Oct 1888, p. 12. Militia standing, The New Lambton Pit. 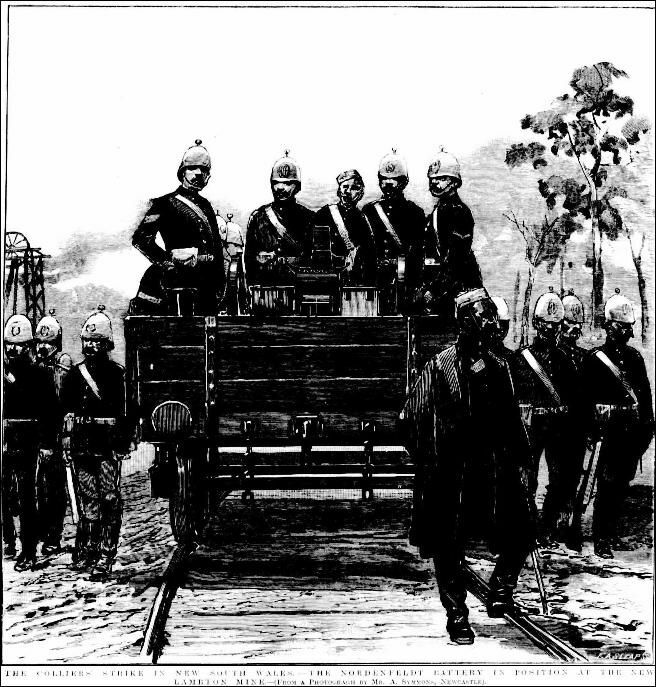 The Australasian, 6 Oct 1888, p. 12. At Newcastle he has more than sustained his previous reputation as a firm, discreet, and zealous public officer. The manner in which he has discharged his duties at the present critical juncture has won for him the highest praise, both from the miners and the general public. 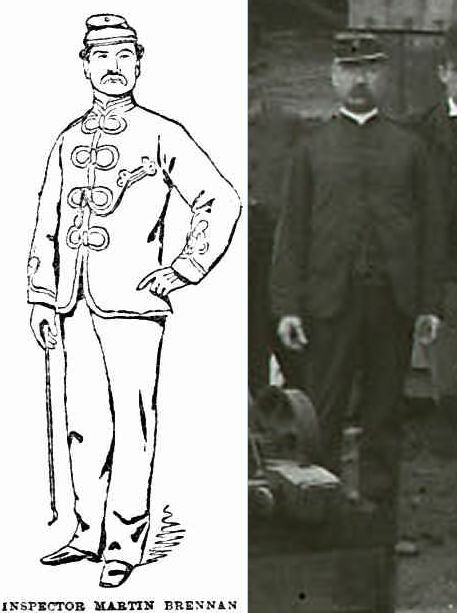 The article also contained a line drawing of Inspector Brennan, and from this we may reasonably guess that he appears in one of Snowball’s photographs. The Braidwood Times website has a studio photograph of Martin Brennan. 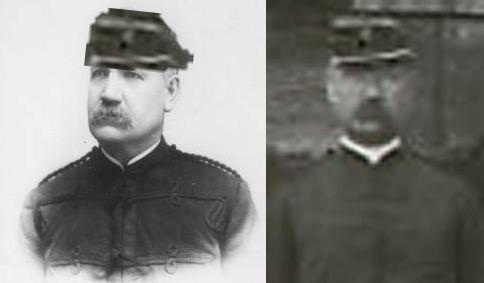 Although his face looks more round in the Ralph Snowball photo, I think the roundness is exaggerated by the low resolution and the cap. When you snip the cap from the pit photo and place it on the studio photo, the resemblance is reasonably clear. 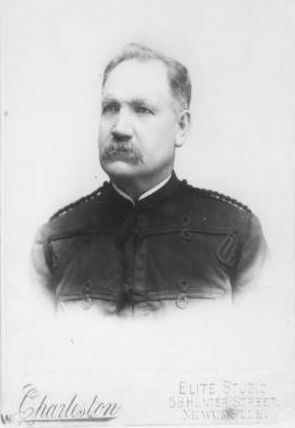 Martin Brennan retired from the police force in January 1907 after 48 years of service, at the time a record exceeded only by his brother Patrick. Martin Brennan died in St Vincent’s Hospital Sydney on 8 August 1912, aged 73. 25 Aug 1888 "For some weeks past the general strike of coal-miners which has impended over this district has been the main topic of public interest … The strike is now an accomplished fact, the men employed in some pits of the district having taken out their mining gear yesterday, while the remainder will follow the same course on Monday." 30 Aug 1888 Manifesto of the Amalgamated Miners' Association, in which they state that their chief grievance is "the attempt of the proprietors to compel the men to work and throw back rubbish from among the coal for nothing, or, in other words, to do additional work without increase of pay." 5 Sep 1888 An explanation of the coalminers' dispute about impurities in the coal seam, including diagrams of coal seams from Fernadale, South Waratah and Borehole collieries. 18 Sep 1888 Lengthy report on the disturbance at New Lambton C Pit where 6 "black legs" (strike breakers) were loading small coal, an up to a thousand miner's and their families arrived at the mine to protest. 18 Sep 1888 Sydney Morning Herald's report of the riot at New Lambton C Pit. 19 Sep 1888 Editorial opinion on the disturbance at New Lambton C Pit the previous day. 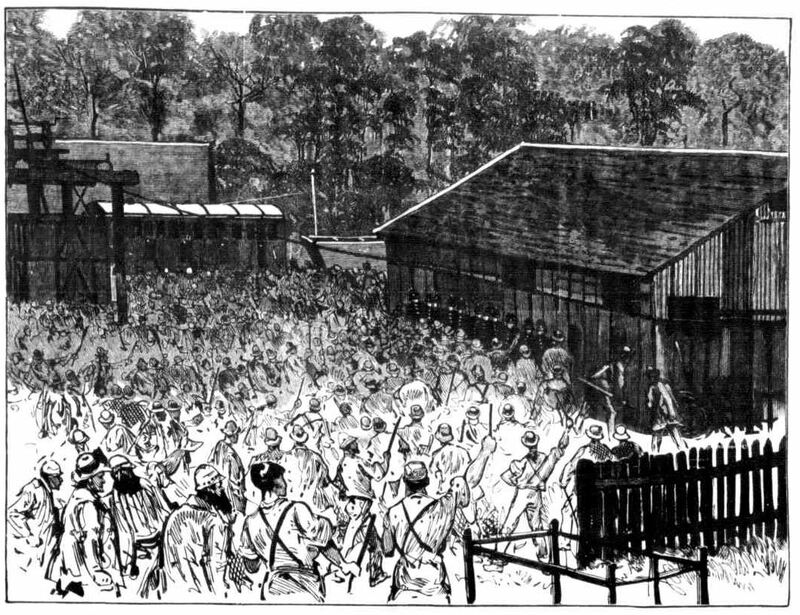 19 Sep 1888 Three men arrested and charged "that they did, at the New Lambton pit, near Adamstown, together with divers other evil-disposed persons unknown, assemble to disturb the public peace, and did then and there make a great riot and disturbance, to the terror and alarm of Her Majesty's subjects there being." 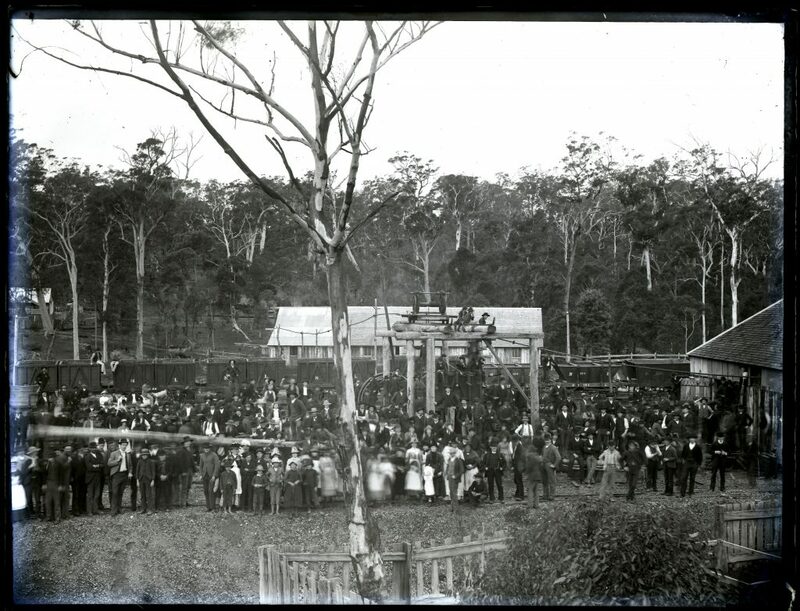 19 Sep 1888 Protest moves on to South Waratah pit, where over 1000 people gather. 20 Sep 1888 "It is given as authoritative that another attempt to complete the loading of small coal at the New Lambton "C " pit will be resumed this morning. Matters in this vicinity bear a very serious aspect." 20 Sep 1888 Editor's plea to miners and management to resolve the dispute peacably. 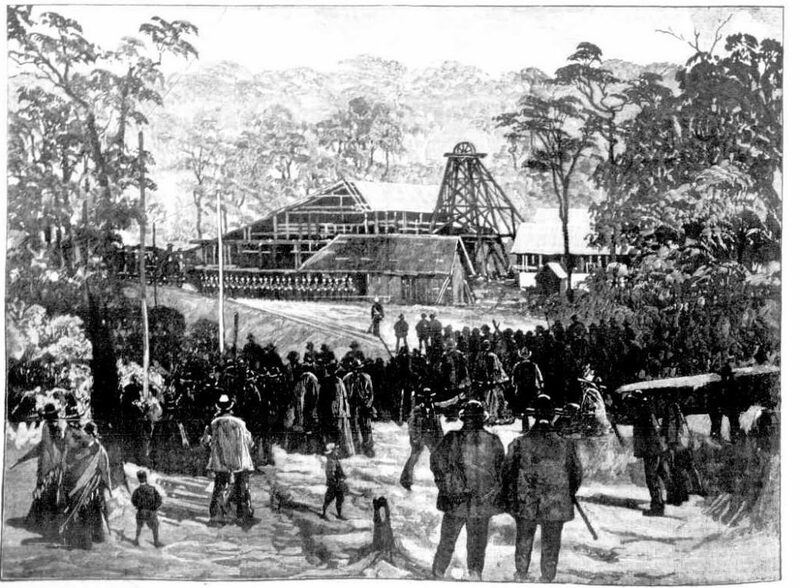 "We are glad to know that strenuous efforts are being made by several gentlemen to formulate an agreement which will be acceptable to both Associated Proprietors and Associated Miners; and it is high time that the difficult task should be worked at, night and day, until the breaches between capital and labour in the district shall have been closed." 20 Sep 1888 "Intelligence was received in Newcastle last night that 100 members of the Permanent Force had left Sydney by steamer for Newcastle last night. Colonel Spalding, C.M.G., will take command of the whole of the forces in the district." 20 Sep 1888 Filling of small coal at New Lambton C pit by four 'black legs' workmen, protected by a a total force of 173 artillerymen and policemen, along with a Nordenfeldt battery gun. 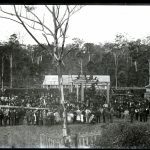 20 Sep 1888 Proclamation by the Governor of New South Wales, Charles Robert, calling for law and order to be maintained in the coal miners' dispute. "It is hereby notified that all persons offending as hereinbefore mentioned, or interrupting other persons in the honest pursuit of their lawful occupations by acts of intimidation or violence, or by disorderly conduct of any kind, will be rigorously prosecuted as the law directs." 20 Sep 1888 A call from the Newcastle Morning Herald for the government to refrain from bringing the Nordenfeldt guns into the miners' dispute. The gun is described as "a deadly weapon, which, when in full operation, keeps up a continuous stream of bullets in whatever direction it may be pointed." 22 Sep 1888 All quiet at New Lambton C pit on Friday. There is an interesting suggestion that Thursday's action was intended as a show of force by the police authorites. "It is stated that no more 'blacklegs' will be brought to New Lambton, and that they would not have been brought back on Thursday had it not been that the police authorities wanted satisfaction." 4 Oct 1888 A biographical article on Inspector Martin Brennan, was the chief of the local police in Newcastle at the time of the New Lambton C Pit disturbance. 24 Nov 1888 Resumption of work after the strike … "To-day all the collieries in the district, with the exception of South Waratah and New Lambton, were at work." 24 Nov 1888 The coal strike "has been finally settled by the vote of the miners throughout the district, who by a large majority decided in favour of resuming work immediately as proposed by the Delegate Board." 8 Aug 1912 Death of Inspector Martin Brennan. Thus began a Newcastle Chronicle report on the ‘turning of the first sod’ of the New Lambton colliery on 25 June 1868. James and Alexander Brown were mining coal from the ‘Old Dog and Rat’ pit in East Lambton when they had a lucky break in 1868. On learning that the owners of Lambton colliery had failed to make payments on a mining lease, the Browns quickly stepped in and bought the mineral rights for 265 acres in the area we now know as New Lambton. They immediately investigated the potential of their acquisition by commencing a trial shaft in April 1868. In June, at a depth of 100 feet, a good payable seam of coal was found and the Browns committed to developing a colliery at a cost of £10,000. To inaugurate their new venture the Browns invited their employees and local dignitaries to a ceremony at the site on 25 June 1868. Two barrels of ale which had previously been conveyed to the ground, were at once tapped, speeches made, and the assembled company called upon to drink “Success to the New Lambton Colliery”. By 1884 the payable coal was exhausted, and the Brown’s moved on to establish other mines. The pit closed, but the town endured. The Chronicle was correct in asserting that the event celebrated 150 years ago was of no ordinary importance, for it marked the birth of New Lambton. 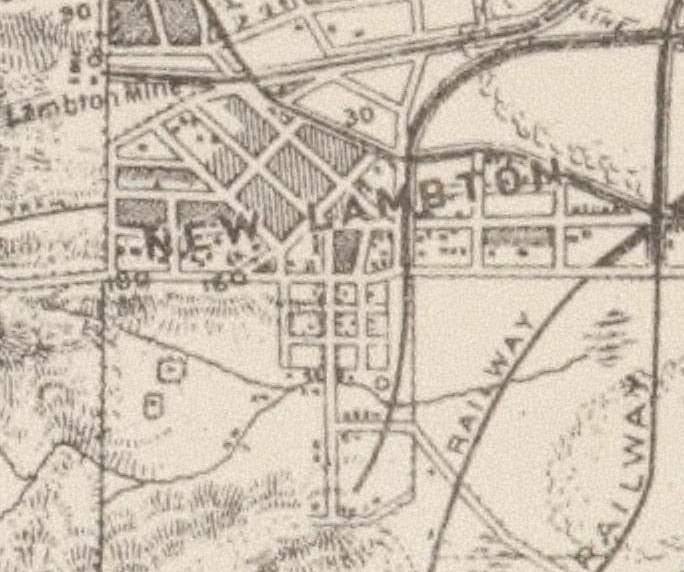 Major T S Parrott’s 1893 map of Newcastle showing the railway and a shaft of the New Lambton colliery. National Library of Australia. Google Earth, showing the New Lambton Colliery mining lease, railway line, and a shaft located near present day Oxford St. The article above was first published in the June 2018 edition of the Lambton & New Lambton Local. Contemporary newspaper articles retrieved from Trove. “The Coal Mines of Newcastle NSW”, George H Kingswell, 1890. Map of Waratah Coal Company blocks, 1873. National Library of Australia. T S Parrott’s Map of the country around Newcastle, 1893. National Library of Australia. Plan of the Hartley Vale Railway, 1867. State Library of NSW. Trying to work out the history of the New Lambton Colliery, and the mines of J and A Brown in Newcastle is a tricky matter for a variety of reasons. The newspaper articles are sparse and often very cursory, and can sometimes contain errors. 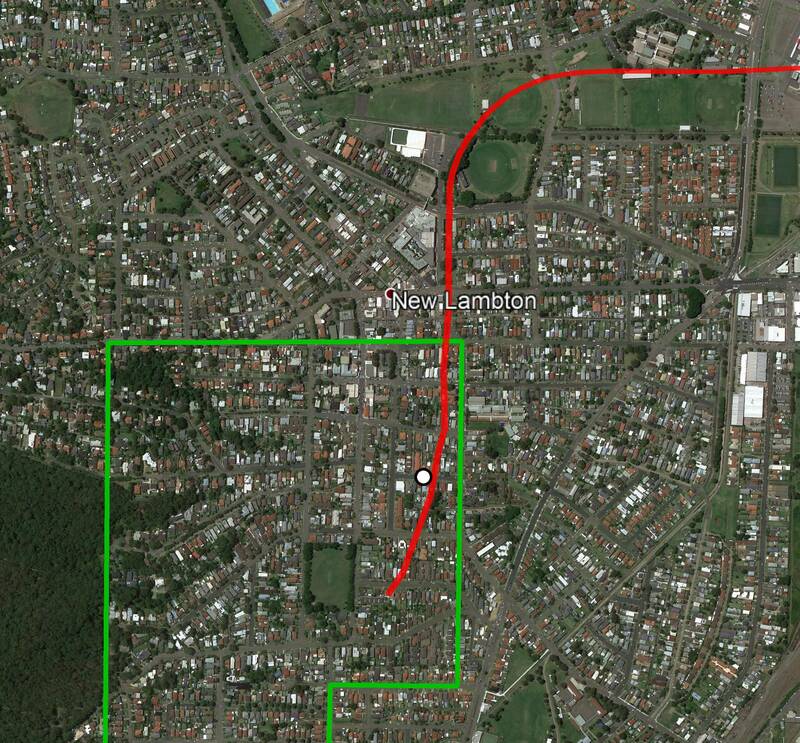 Suburb names in a mine name can be misleading and bear no relation to geography. The classic example of this is the “East Lambton Colliery”, which was located in New Lambton, and operated by the Waratah Coal Company! Bearing in mind these difficulties, here’s my summary of the Brown’s mining leases and the history of New Lambton colliery. White Development of this 310 acre lease commenced in 1861. It was initially known as Brown’s Pit, and later as the Hartley Vale Colliery. The colliery was ready for production at the end of 1864, but was a commercial failure. Blue This 280 acre lease was obtained by J&A Brown in 1862. 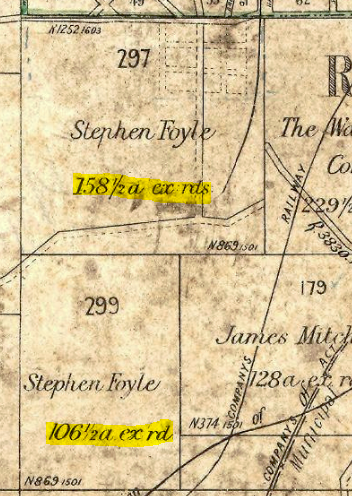 Two pits (marked as A and B pit on the 1867 Hartley Vale railway map) were commenced to the north of the Lambton colliery railway in 1866. The B Pit later became known as the “Old Dog and Rat Pit.” This pit was connected to the New Lambton/Hartley Vale railway via a tunnel underneath the Lambton railway. In 1867 the “New Lambton Coal Pit” was opened on this lease, to the south of the Lambton colliery railway, with a short curved branch line off the New Lambton railway. This pit later became known as New Lambton A Pit when the new ‘B’ workings were opened up in the 265 acre lease in 1868. (See below.) Some time around 1883 the New Lambton A Pit was renamed New Duckenfield Colliery. Orange/Red This 640 acre area consisting of two 320 acre leases was obtained by J&A Brown and Stephen Foyle in March 1867. The December 1867 Hartley Vale Railway act shows that the Brown’s intended to build a railway to this lease, but it was not completed at this time. After the New Lambton second workings began to wind down in 1884, the New Lambton ‘C’ Pit was commenced in this area in 1884, and the railway finally completed in March 1884. The mining leases of J and A Brown. The mining leases of J and A Brown in Newcastle, overlaid onto 1873 map. 1944 aerial photograph that shows the remnants of the New Lambton railway traversing the park. 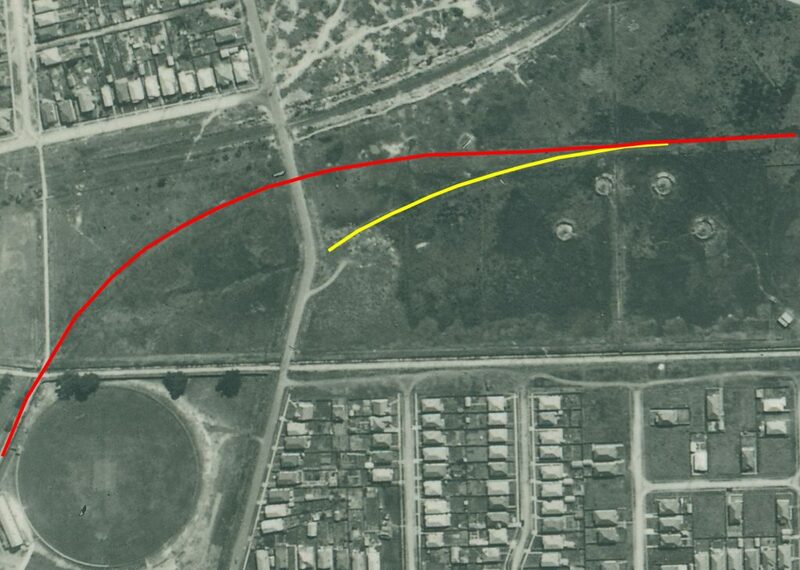 Path of rail line to New Lambton B pit marked in red, and the short branch line to the New Lambton A pit marked in yellow. 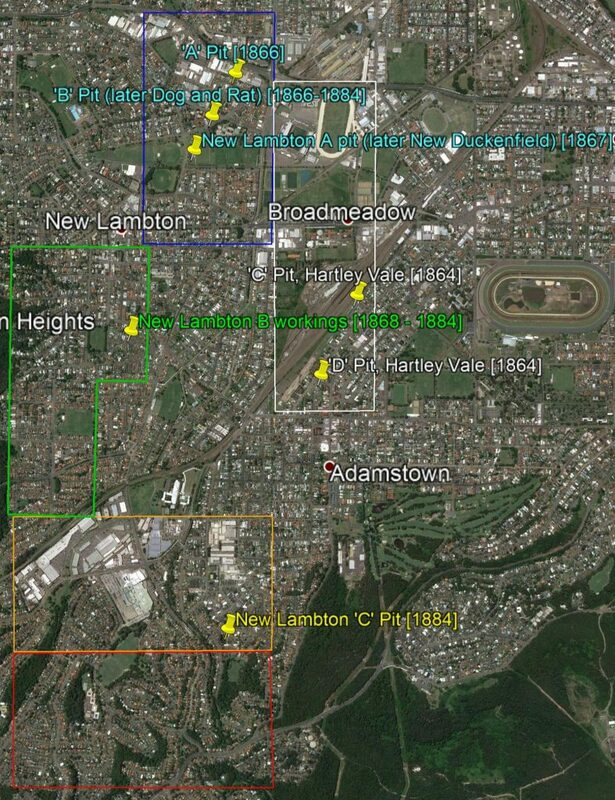 On page 45 of “The Coal Mines of Newcastle NSW”, Kingswell states that the New Lambton Estate consists of 1225 acres. In the year 1867 Messrs. J. and A. Brown commenced to work coal from the New Lambton Estate, which at present is the freehold property of Messrs. George R. Dibbbs, and Alexander Brown, M’s. 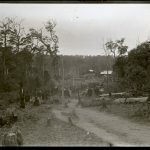 P. It consists of 1225 acres, and is bounded on the north and east by the Commonage, on the south by the Waratah Coal Company’s land, while the estate of the Scottish Australian Mining Company forms the western boundary. Prior to opening a mine the firm obtained a mineral lease of some 280 acres from the Government, and on this block, which lies to the north of the present estate, the now celebrated Dog and Rat, or A Pit, was sunk. Where was this 1225 acres? It is difficult to be certain, but given that in the next sentence he refers to the 280 lease as being “prior” and to the north of the “present estate”, then it is reasonably clear that the 280 acre lease (blue) is not included in the 1225 acres. 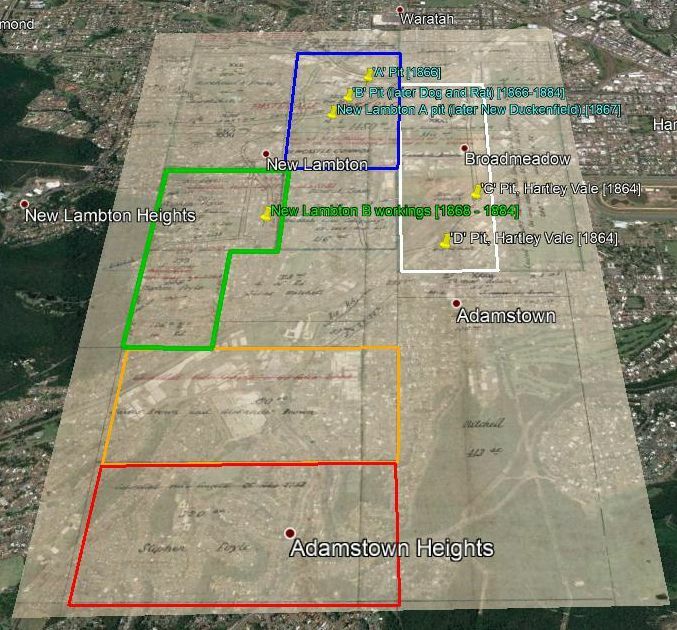 Thus adding the 310 acres (white), 265 acres (green) and the 640 acres (orange/red), comes to a total 1215 acres, which is very close to the figure of 1225 acres that Kingswell state. The discrepancy of 10 acres could be accounted for in two ways. It is possibly simply an adding up error, or possibly because the 265 acre lease on the maps is marked as “ex rds”, and that these excluded roads account for the missing 10 acres. 3 Dec 1867 First mention of New Lambton colliery in the newspapers. The article is reporting on the opening of a section of the Hartley Vale Railway, that leads to a new pit a pit "about half a mile ... from the Lambton Colliery, and which has been denominated by the Messrs. Brown 'The New Lambton Coal Pit.' "
If the distance of half mile is correct then this is almost certainly referring to a pit in the 280 acre lease in East Lambton. The article goes on to state that "The line further leads to a pit on the other side of the South [sic] Australian Company's Railway, underneath which a tunnel has been made." This is possibly referring to a connection to the Dog and Rat Pit which was to the north of the Lambton colliery railway. 4 Jan 1868 James and Alexander Brown obtain the mineral lease for what would become the New Lambton mine, after Messrs. Morehead and Young of the Scottish Australian Mining Company indavertently fail to keep up payments on the mineral lease. 25 Jun 1868 'Turning the first sod' of the New Lambton Colliery. 30 Jun 1868 "The tunnel now in operation [the 280 acre east Lambton lease] will I believe give remunerative employment to about sixty miners, and I have no doubt, a profitable return to the proprietors for capital invested therein, until the new pit [265 acre lease in New Lambton] is in full working order." 4 Jul 1868 "The new railway works at the New Lambton Colliery are being pushed forward as fast as practicably, and are I believe progressing satisfactorily." 4 Jul 1868 Advertising for tenders for the sinking of the new working pit, and for earthworks in the extension of the New Lambton railway. 18 Jul 1868 "The new line of railway at the new Lambton colliery is making considerable headway but the sinking of the new working pit has been considerably delayed in consequence, I believe, of the difficulties experienced in getting a boiler across a swamp separating the new pit from the end of the present railway." 5 Sep 1868 "The extension of the New Lambton railway, is, I believe, progressing satisfactorily, and will, it is expected, in a short time, be so far advanced towards completion as to enable the proprietors to convey direct, any materials that may be required at their new pit, which is now down about seventy feet. It is expected that the coal in this shaft will be found at a depth of about 120 feet." 31 Oct 1868 The Brown's New Lambton colliery "line of railway will be shortly completed." 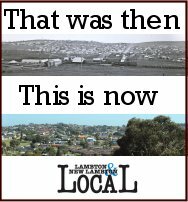 29 Jul 1869 "New Lambton is still going a-head, and buildings of all descriptions are multiplying fast. I am glad to see that those enterprising and really spirited men, the Messrs. J. and A. Brown, have commenced making a new line of railway to another new pit." 3 Mar 1877 "Plans and specifications have been prepared for a bridge to cross the New Lambton Railway, and tenders will be called for the erection at once." This was for a bridge on Lambton Rd (where Royal Place is now) to go over the New Lambton railway. 25 Aug 1883 "The proprietors of the New Lambton Colliery are sinking a new shaft on their estate some mile and a-half from the present pit." 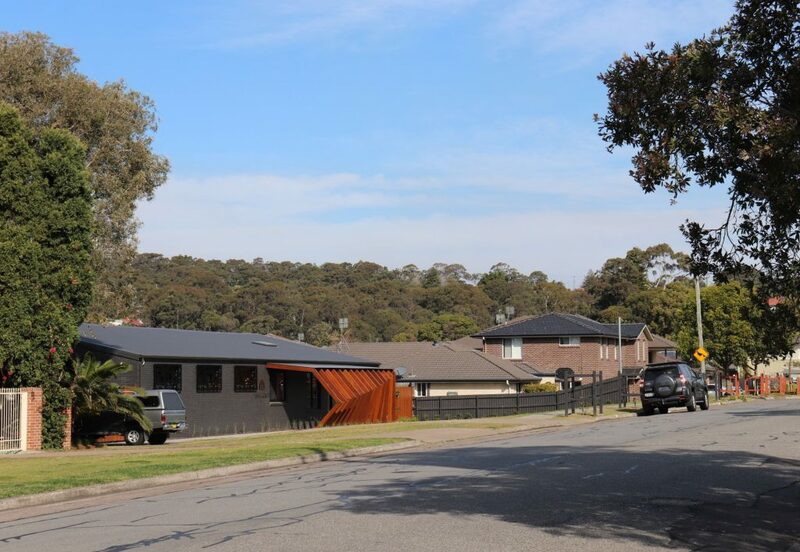 This was the New Lambton C pit, which was located in the present day suburb of Adamstown. 22 Mar 1884 "The railway to the new pit [C Pit] on the New Lambton Company's estate has been completed throughout in a very workmanlike manner by the contractor, Mr. Chas. Turner, and a large staff of workmen. The line is about two and a-quarter miles in length from its junction with New Lambton railway to the pit mouth." 1 Aug 1890 New Lambton council prepares "specifications for the work of pulling down the New Lambton Railway Bridge, on the main road, and filling up the road." 6 Aug 1890 Tenders called for "filling in roadway over New Lambton railway at main road bridge."